In additions to carbon, silicon, and manganese, SUISIN INOX Western style series blades also contain chromium and molybdenum. They are recognized for excellence in both rust resistance and sharpness. All blades in the SUISIN INOX Western style knife series are hand sharpened using the honbazuke method, guaranteeing an edge that is already extremely sharp when you place your order. SUISIN INOX Western style knife handles will conform well to the palm of your hand. They are secured firmly with rivets and standoffs, offering weight and stability, and a comfortable, rounded grip. The palm-conforming shape will make this knife your favorite for a long time to come. Materials: INOX AUS 8 (8A) steel, rust-resistant knife for commercial use. A mixture of 0.10%-0.25% molybdenum lends the blades in this series an additional tenacity, making them more difficult to chip and giving them a sharper edge. 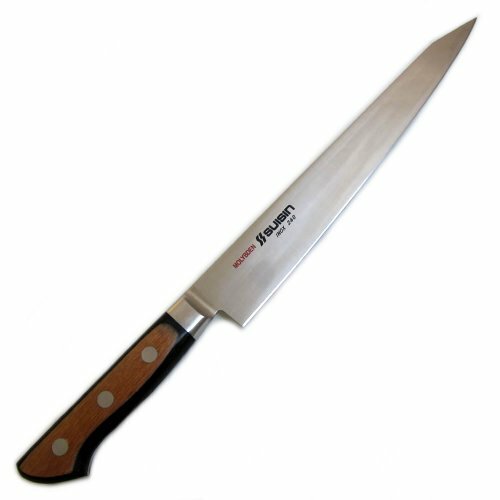 Features: The knife is made for professional use, making it not only excellent for restaurant and bar use, but terrific for home use as well. These knives have an excellent reputation for sharpness and rust resistance, as well as for their great grip. With great rust resistance and sharpness, a comfortable grip, and with reduced sharpening time thanks to being extremely easy to sharpen, these knives will handle all of your basic professional functions.